The Vegetables We Eat A nonfiction, illustrated look at the life cycle of vegetables from seed to table. This Year's Garden The Story of a garden from winter to winter with all the planning and work in between. Blue Potatoes, Orange Tomatoes an illustrated nonfiction book that looks at the variety of heirloom vegetables, and talks about how to grow a rainbow vegetable garden. Eating the Alphabet Not strictly a vegetable book, but I find myself bringing this book out any time I think it works. And the Good Brown Earth A story about a boy and his grandmother, and their garden. I love this book. This potato was kind enough to sprout roots just in time for vegetable week! ~Flower Fairy Poem: we reread The Songs of the Strawberry, Thrift, and Bluebell Fairies. Our last week with Little Boy Blue. I asked Cyrus to draw a picture, and then write a story inspired by the poem. His story was that of a purple cow that was eating corn, when a boy came to pick some for his family. In the end the cow ate most of it, and the boy was able to take a little home. Clearly the cow is the hero. we made salt dough vegetables, then painted them with acrylic paint. 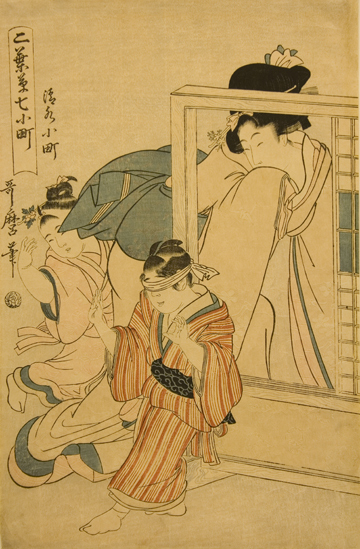 we examined Blind Man's Bluff, by Kitagawa Utamaro. Cyrus: There's a bunch of flowers on the mothers clothes. They are all having a great time playing a game. It looks like fun. Ava: It's really interesting. There's lots of little details. I want to play this game today. We read about the old kingdom of Egypt, the difference between BC, BCE, AD and CE, making mummies, and the construction of the Egyptian pyramids. We talked about the distinguishing features between the plant and animal kingdoms. Using natural examples that we have around the house we sorted items into two categories. The listed the characteristics that each category had in common (needing water), and characteristics that separated them (making own food vs finding food). This week's composer is Franz Joseph Haydn. The father of Symphony. I'm pretty sure Cyrus chose him based solely on his white wig. I made a youtube play list consisting of seven of his symphonies, and three of his sonatas for as total of over three and and a half hours of music. Youtube has been immensely useful this year. Cyrus and Ava have a favorite place to sit and work on their nature journals. Telling stories, talking about their creations, or just sitting side by side to work. Reading through the blessings from this book again, we narrowed down our top dozen choices. With our choices in mind Ava and Cyrus chose a blessing that they most wanted to see added to our table blessings collection. Next week I'll have them paint a small picture that represents this blessing. Inspired by this post here, and this suggestion, we took a trip to our a local grocery store to see where our produce comes from. Ava has plans to take this project further. At several points during our week I could look up to see this. My two children had their bike helmets on 90% of the day. Ready to go hop on their bikes in a moments notice. A fantastic week. I love being a homeschool family.